Background: Microwave-assisted synthesis is an important field of research in relation to the drug discovery and development process. Particularly, microwave-assisted organic synthesis (MAOS) is a significant strategy by which the synthetic chemists achieve their goals in a fraction of time as compared to conventional methods. Methods: Over the past decades, the development of novel and efficient methodologies has been reported on C-N bond formation. Here, an efficient, solvent-free, environmentally benign, microwaveassisted synthesis of substituted piperazine benzazole derivatives is reported. 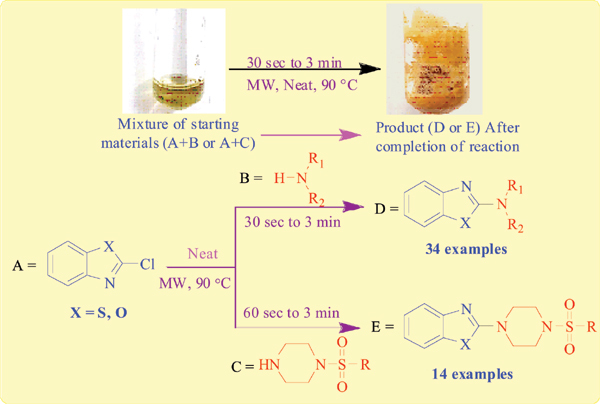 The reaction time for the synthesis of benzazole derivatives was drastically reduced from a reported 2-4 h to only 30-180 sec. Results: The protocol achieves wider substrate scope and good to excellent yields with ease of purification, in which compounds will get separated without using chromatographic technique. Conclusion: We have developed a simple and highly efficient eco-friendly approach under microwave assisted conditions without adding any external solvent, for the preparation of various aryl piperazine and aryl sulfonylpiperazine benzazoles derivatives. The salient features of this methodology are efficacy, environmentally benign nature, wider scope of substrate choice, ease of product purification, and non-involvement of catalyst, base or solvent. 2-Chlorobenzazoles, amination, microwave irradiation, piperazine, solvent free, sulfonylpiperazines.